This article is about the smaller strawberry. For the larger strawberry, see Combustion Berry. The Sunseed Berry (ヒダマリノミ?, lit. : "Sunny Spot Seed") is a treasure found in Pikmin 2 and a fruit in Pikmin 3. It is actually a regular strawberry. 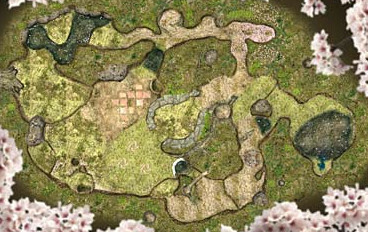 In Pikmin 2, it is found on the Awakening Wood, while in Pikmin 3, there are four of them: three in the Garden of Hope and one in the Distant Tundra. The Sunseed Berry is found sitting on a ledge just across from the landing site in Awakening Wood, and can easily be obtained, as it is guarded only by a Red Bulborb and two Dwarf Red Bulborbs. 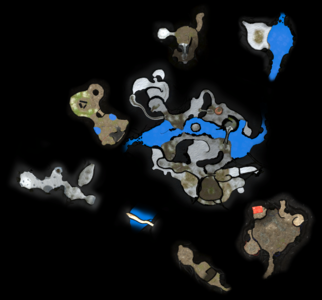 The ledge is low enough that any type of Pikmin can be thrown up to collect the treasure. Alternately, you can go around to the path that leads to the Snagret Hole and get it there, but this is more time consuming and dangerous. This Sunseed Berry is on a ledge next to Brittany's crash site, and can be obtained easily. Defeat the Red Bulborb on the path that the Pikmin will take to ensure a safe recovery. Another Sunseed Berry is on a ledge by a pile of Fragments used to build an orange bridge; defeat the Skutterchucks nearby, as they may throw crystals at the player's Pikmin. The last Sunseed Berry in the area is underwater, past the large cinderblock after Louie runs away. It is near a dirt wall. It is protected by several Puckering Blinnows, which should be defeated so the Pikmin can safely get the fruit. In the Distant Tundra, the only Sunseed Berry is inside a Pyroclasmic Slooch, which is in an enclosed area sealed off by a crystal wall, along with another Slooch. Along the way back there is a Joustmite and a Bearded Amprat; defeat these as well to ensure the Pikmin have a safe route back to the ship. Golden Sunseeds are fruits found in Pikmin 3's Mission Mode and Bingo Battle. They are a golden variety of Sunseed Berries, and are thus very valuable: they are worth × 200. Aside from being worth four times as much as Sunseed Berries, they are functionally identical to their regular counterparts. Artwork of the treasure from Pikmin 2. The Sunseed Berry in Pikmin 2. Analysis of the Sunseed Berry in Pikmin 2. 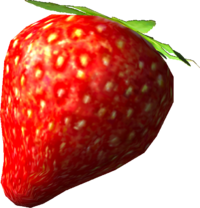 Close-up of the Sunseed Berry in Pikmin 3. The first Sunseed Berry from the Garden of Hope. The second Sunseed Berry from the Garden of Hope. The third Sunseed Berry from the Garden of Hope. The Sunseed Berry from the Distant Tundra. A few Red Pikmin carrying a Sunseed Berry in Pikmin 3. Six Golden Sunseeds in Pikmin 3. A strawberry in the real world. The first trailer released for Pikmin shows Yellow Pikmin returning a similar strawberry to their Onion. In the E3 2012 demo of Pikmin 3, Golden Sunseeds were referred to as Combustion Berries, a treasure from Pikmin 2. This page was last edited on February 19, 2019, at 19:25.